Our surf camp and surf school are based in Tamraght, a traditional Moroccan hamlet located on the hillside with stunning panoramic views to the coast and only a short drive from Agadir airport. Whilst surf tourism has boomed in the Taghazoute area in recent years Tanraght village has not been overdeveloped and still retains its original Moroccan/Berber charm/character. Our “All Inclusive” Surf Camp is the perfect option for single travellers or groups of friends who want to stay in a sociable environment where everything is taken care of by the team. 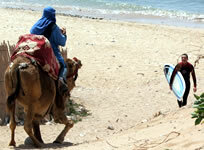 The stunning coastline north of Agadir offers a variety of surf breaks to suit all levels of surfers. Beginners and intermediates will enjoy surfing the many good quality beach breaks stretching from Tamraght (Devils Rock) to Tamri further north. Experienced surfers will enjoy surfing the many world class reef and point breaks that litter this coastline including Panaromas, Anchor Point, Killer Point & Boilers. Although Morocco has good surf conditions all year round the pleasent climate, consistent groundswells from October to April and close proximity to Europe make it a very popular winter surf destination. The world class waves, warm climate (over 330 days of sunshine per year), cheap living and friendly laid back people make the area north of Agadir a true surfing mecca. Please note: *all prices quoted in Euros (€ EUR) and are per person per week. Places are subject to availability at time of booking. 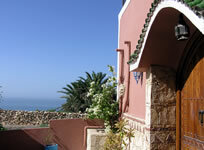 NOTE: Flights are not included in price, check out our Getting There guide for low cost flights to Agadir (AGA) Airport. 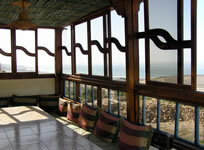 OVERVIEW: The accommodation is located in the Moroccan village of Tamraght between Banana Village, Devils Rock and Tamraght. The Surf Camp comprises of two traditional Moroccan style houses which are located on the hillside in their own private grounds/gardens with stunning panoramic views to the coast and ocean. Each property has a traditional central courtyard with chill-out area with the bedrooms & bathrooms leading off it. The main house has a large covered and additional alfresco terrace both with stunning panoramic views to the ocean which are primarily used dining and chill-out areas. The surf camp can accommodate up to 35 people between the two houses and there is a good distibution of bathrooms/showers. The house has a great vibe and atmosphere and the local surf team are there to help make your stay as comfortable and enjoyable as possible. BEDROOMS & BATHROOMS: The main house comprises of 2x twins, 1x double, 1x triple, 2x quads and 1x double (en-suite). 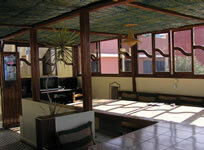 The 2nd house comprises of 4x quad rooms. Each house has 2 bathrooms with WC, showers and hot water. 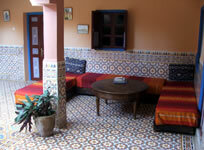 MEALS: The onsite kitchen and cook provide a delicious and hearty range of typical Moroccan and European cuisine. Breakfast, picnic lunch and evening meals are included. FACILITIES/SERVICES: Sat TV, DVD player, free WIFI, Rooms are cleaned prior to arrival, bed linen is provided and changed weekly and there’s also a local English speaking manager. Bath and hand towels are not provided. 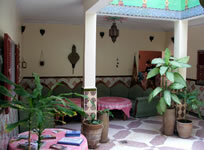 Other services (paid locally) include transport to local Moroccan massage parlour and hamman (bath house). 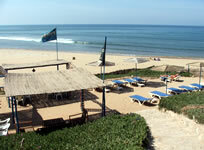 The Surf School sponsored by Rip Curl was founded back in 1995 by local French Moroccan surfer Philippe. Since then the school has expanded into one of the areas respected Surf Camps that offers guests a real home from home experience with a Moroccan twist. The Surf Instructors are all qualified via one of the many Surfing Federations within Europe including the BSA & ISA. All instructors have the necessary skills and patience to help you progress in a safe but fun enviroment at your own pace. The Beginner coaching sessions are aimed at those who have never surfed before or who have already taken a few lessons but need more guidence. The Intermediate coaching sessions are aimed at those who are starting to catch green waves and making their first turns etc but feel they need to improve further. The Advanced coaching sessions are aimed at those who are surfing on a regular basis but need to make the step up to surfing point or reef breaks or learning more advanced techniques. The beginner and intermediate lessons are run at beach breaks such as Devils Rock, Banana Beach, Croco, Panoramas & Tamri. For safety reasons and to ensure you get the attention you need on dry land and in the water, the Surf Lessons have a low student to instructor ratio, typically 7 students to 1 instructor or less. Groups are split by ability and students are placed with an instructor who specialize in teaching at a particular level. The surf lessons comprise of 2-3 hours coaching in the morning followed by free surf practice sessions after a break for lunch under the supervisions and guidence of the instructors. All the equipment used by the Surf School is specifically designed for beginners and intermediates with safety being the key factor. Beginners will use softdeck boards specifically designed for both stability and safety. Intermediates will use Epoxy boards which provide a good blend of stability, manouverability and performance. The instructors will select a board suitable for your size, weight and ability. Who’s it for? The guided surfaris are aimed at totally independant surfers with their own equipment, who have a few surf seasons under their belts and are comfortable surfing a wide range of beach, reef and point breaks. What to expect? One of the team will take small groups of surfers to explore some of the best surf breaks this coastline has to offer from Tifnit in the south to Immessouane in the north, taking in all the world famous breaks along route (Devils Rock, Banana Point, Anchor Point, Killer Point, La Source, Boilers etc)Each day the surf spot will be chosen based upon th groups ability, swell and wind conditions. The surf guide will also provide hints and tips about each break including entry/exit points, channels/rips and the wave setup/line-up. Guided Surfaris Surf Equipment:*** We strongly recommend that clients bring their own quiver of surfboard(s) & wetsuit. If you can’t bring your own equipment then a range of surfboards and wetsuits are available for clients to use at the surf camp. Best Season: Although Morocco is blessed with consitent surf all year round, for experience surfers looking for solid surf we recommend visiting from October to April. Moroccon cuisine draws its influences mainly from Africa, the Mediterranean plus the culinary traditions of the Berber and Arabic people. Over time these methods have been refined to produce todays distinctive Moroccan cuisine with its subtly blended flavours. Thanks to the good climate and fertile land most Moroccan food is produced locally, mainly by small-scale farmers. This produce is typically sold through street market stalls and souks. The popular local dishes are Couscous, Djaja Mahamara (chicken stuffed with raisins, almonds, and semolina), Tajine (an aromatic lamb or chicken stew) and Mchoui (pit-roasted mutton). Popular desserts are Kab-el-ghzal (almond pastry) and Pastilla (rich, pigeon-meat pastry). Meals are usually washed down with fresh Mint Tea. Alcohol: There are no restrictions on alcohol sold to tourists. As an Islamic country there are, at least in theory, restrictions on sale of alcohol to Moroccans (Muslims) and drinking in public is frowned upon. Most restaurants and brasseries (Moroccan bar) especially in tourist areas serve alcoholic beverages. Flag is a popular local beer and the wine regions in the Atlas mountains produce good quality French influenced Red and Rose Wines.